Our Asset Verification team takes an inventory of all of the assets of your residential, commercial or personal property for insurance planning or claim purposes. If your property is affected by burglary, fire or any natural disaster, the insurance company expects a list of items that were damaged or stolen in order to file reimbursement claims. We take care of that, so you don't have to. Do you have a complete list of each and every asset owned by your business entity or by yourself personally? Does that include all of the support information for an insurance claim, financial transaction or estate planning project? Can you access all of this crucial data at any time, in a secured format? ASVERIS can address these challenges with our safe, secure & confidential "Asset Verification Solution." As a preventative company, we provide peace of mind. By having documentation before any incident occurs, we force insurance companies to play fair when disaster strikes. 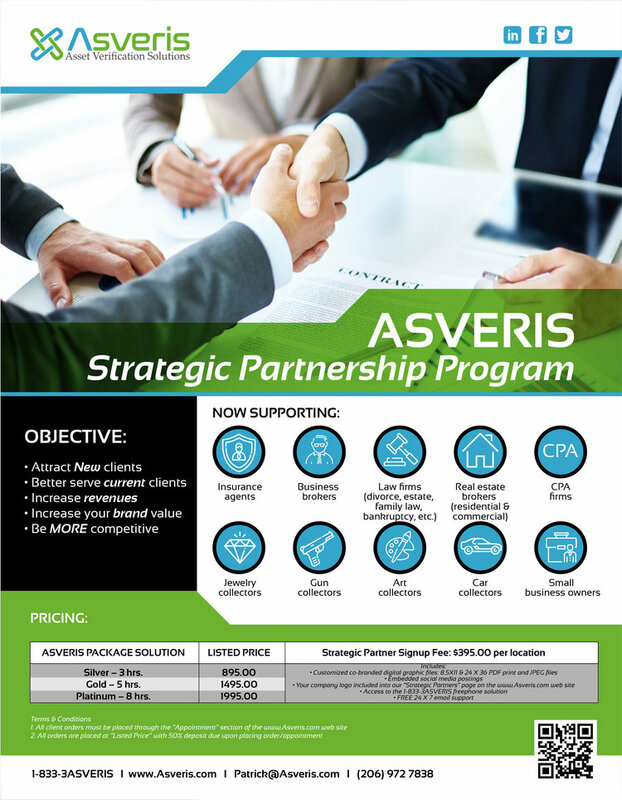 Anyone who has faced reduced settlements as a result of a claim understands the need for our services and the value Asveris generates for all our clients. We provide support for when you face your insurance company. View informative videos, listen to interviews with Patrick Kane or browse through our brochures to learn more. LESS THAN 5% of all policyholders read and fully understand their homeowners policy and coverage options, or their business policy and coverage options. APPROXIMATELY 80% of all U.S. homes and businesses are underinsured because aggregate limits are inadequate. To schedule a consultation, please select a package from the options to the right. If you have any trouble using the form, feel free to call us at 1-833-3ASVERIS. Or call us at 1-833-3ASVERIS to schedule your appointment.